Real Russian dolls are created in a variety of sizes and each fits inside a larger one, This distinctive feature makes these little dolls fun to use in crafts. This is simple to do using our template, simply change the size of the template using the settings on your printer to create different sized templates so the dolls look just like the real thing! 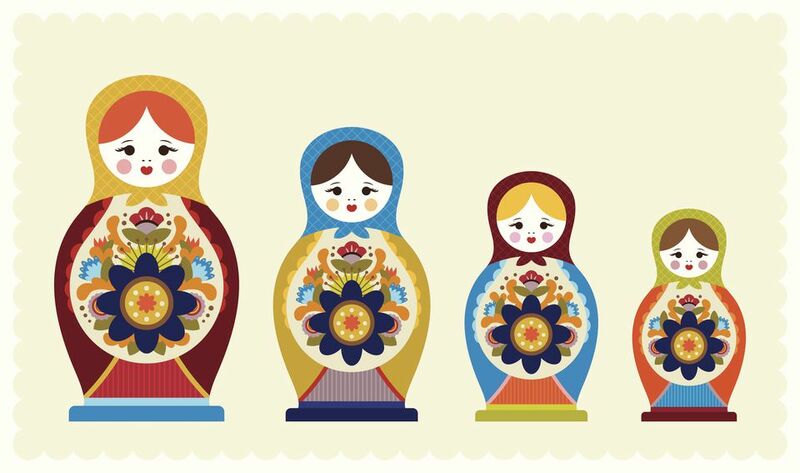 Use this free Russian doll template to make unusual greeting cards, banners, gift cards and more! The simple doll template is broken down into separate pieces making it a good paper piecing project and an ideal way to use up odds and ends of paper and materials from other projects. The template is easy to use. Simply print the template onto paper and use this to cut shapes from pieces of paper. Any paper can be used. Decorative scrapbook papers are ideal and your own custom designs can be created by stamping onto plain paper to make the Russian doll's clothes. Two face options are provided, as well as a blank face for you to add your own features. There is also a choice of headscarf options. Another way to add color and decoration to the Russian doll's clothes is to stamp onto plain paper to create the design. You could also doodle onto the clothes to create your own unique designs. This is not only a fun way to add interest and pattern to the clothes, it also is a therapeutic way to relax while also being creative. The free printable Russian doll template is available for download above. For ideas for using this Russian doll template see this gallery - Russian Doll Ideas. Templates such as this Russian doll template are a useful resource to have when you are crafting. Whether you are a beginner crafter or someone with more experience, these templates make it easy to add a variety of shapes to your projects quickly and easily. While we've spoken above about using this template to cut Russian doll shapes from paper or card stock, you could also use this template to cut shapes from fabric such as felt or cotton. These would make cute embroidery projects as well as being great embellishments.